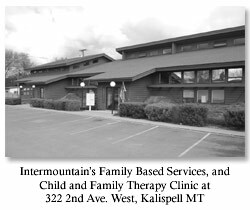 Late in 2008, Intermountain opened Providence Home, which you no doubt already know is the first and only emergency shelter in the Flathead Valley for young children who are victims of abuse and neglect. Several months later, we opened an out-patient mental health clinic, followed a year later by a service providing supervised visitation and training for parents. All of these services started because we listened to the people in the Flathead Valley who dealt with children and families. We quickly realized there were significant needs for these services in the area, so we worked hard to address them. These needs still exist, and so do our services. Hundreds of children and families have received the help they desperately needed because of your help. But another need existed, and it was only a matter of time before we had the personnel locally to address it. Last month we launched what we call Family Based Services, or FBS. It is work we already do elsewhere in Montana, so the transition is a relatively easy one. FBS is a combination of three different services that work in harmony to help us achieve our mission, to “secure emotional health and a loving, permanent family for each child”. FBS started in the Flathead with an intentionally-small client load. One of the three services is called Therapeutic Family Care, which is an in-home extension of existing therapeutic services that focuses on family skill-building. A Treatment Coordinator works with the family to implement skills learned either in therapy or in a classroom to try and keep the family healthy and safe. The second service is called Psychiatric Residential Treatment Facility (PRTF) Waiver services, which essentially is an effort to provide all the necessary tools and supports for a family to keep their child or children from needing to be placed in a treatment facility. It is also used to restore a family when a child has been placed in such a facility and is returning home. We most commonly refer to this as “Wraparound” services, because it offers a wide variety of services, tailor made to fit the child and family’s needs. The third service is our already-existing family visitation, which fits nicely under the FBS umbrella. When parents have their child removed by Child and Family Services, they are put on a program to reunite their family. One of the paths toward restoration is supervised, documented visitation with the child. Intermountain’s professionals assess the parent’s ability to care for the child and train them to be the best parent they can be.